We are pleased to announce that Buck Rogers will be joining the NTOA as Training Program Manager. In this role, Buck will support the director of training and education and the instructional cadre, develop and implement new courses, and identify emerging trends in tactical law enforcement training. He also will manage the NTOA Academy. Rogers has been active with the NTOA for years, teaching our SWAT Command I and Command II courses, and was integral in building the NTOA Command College. He is a 28-year veteran of the Bryan (TX) Police Department and served as a training coordinator for the Texas Tactical Police Officers Association. Rogers served five years in the U.S. Marine Corps and three years in the Texas Army National Guard Co G 143rd Airborne/Ranger LRRS. 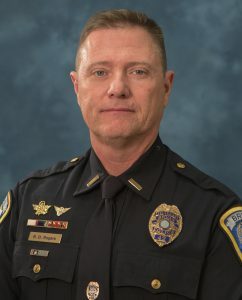 He earned a Bachelor of Arts degree from Texas A&M University and completed the Leadership Command College in 2010 and FBI National Academy Session 246. He has recently earned a master’s certificate in Homeland Security (2012) from the Bush School of Government and a master’s certificate in Criminal Justice (2011) from the University of Virginia. He is a certified TCOLE and firearms instructor as well as a rappel master. He is also an ALERRT active shooter instructor. He may be reached at brogers@ntoa.org.